Recently I was invited to do a presentation on ‘designing environments for people with dementia’ at a geriatric and psychogeriatric colloquim at Orange Hospital. The conference was extremely interesting – in so many ways, but the highlight for me was being given a tour of the hospital itself. A ground-breaking partnership between Orange Health Service and Orange Regional Gallery is making an extensive range of original artworks available within a health setting. The Gallery is exhibiting works from its permanent collection throughout the General Hospital and Bloomfield Psychiatric Hospital, bringing the collection to over 200,000 people per year. Exploring the collection provides a change in focus for visitors and staff. Regular art tours are conducted by the curator for staff and the general public as well as tailored sessions for Bloomfield Psychiatric Hospital residents. In addition to its own extensive collection, the Orange Regional Gallery is also custodian to the Chroma Collection and the Kedumba Collection of Contemporary Australian Drawings which are also being exhibited at the Health Service. A growing body of evidence suggests that the arts can contribute significantly to a sense of wellbeing and can aid in recovery in health settings. Various art forms such as music, theatre, performance, participatory arts projects, visual arts and crafts are assisting in humanising and bringing warmth to what can be sterile and alienating environments. 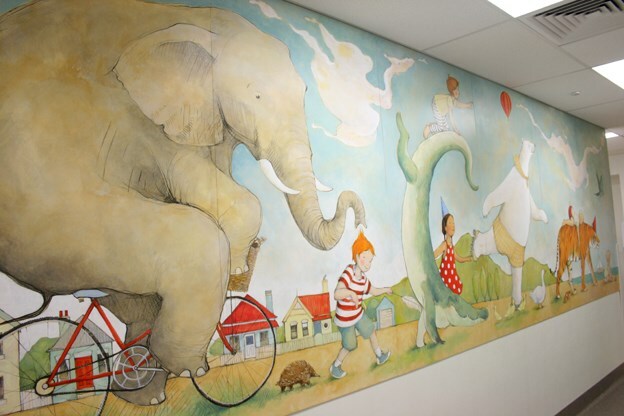 The Children’s ward at Orange Health Service now has a wonderful new mural by Orange based award winning illustrator Freya Blackwood. The 6m mural depicts a lively procession of children and animals on their way to the seaside. The cast of characters includes an elephant riding a bike, a sleeping child on the back of a tiger, a little boy tickling a crocodile and a very easy-going roller-skating polar bear. There are many smaller details too which emerge the longer you look, which is perfect for a children’s ward where young ones and their families are often needing a colourful distraction. In our own office we are collaborating with local artists to install REAL artworks in aged care environments. Susan Doherty is a Sydney based artist whom we have met and whose work we have had installed in aged care facilities. Susan makes visually and texturally rich ‘assemblages’ from collections of everyday objects from the past. The unique quality and interest from the assemblages invites the viewer to touch and engage with the memorabilia of the objects. They are amazingly clever and inspiring. These art works are so appropriate for older people and especially for nursing home environments that often lack the combination rich visual and tactile and noteworthy pieces of a real one-off art work.